In early 2001, while advising Corbis Corporation and its news agency, Sygma, I received the most innocuous call from the news director. On assignment for Time Magazine, a Sygma team was covering the ultimately successful attempt by Erik Weihenmayer, the first blind climber to summit Mt. Everest. Unbeknownst to most, however, they had another unpublicized project. They were working with a team that trying to locate the body of Sandy Irvine, who along with his more famous climbing partner George Mallory, had disappeared in 1924 while trying to be the first humans in the world to climb Mt. Everest. 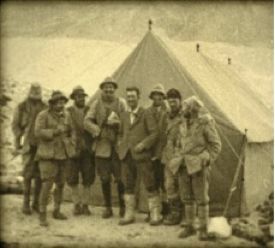 Mallory (center) at the Everest base camp in 1924. Fascinating stuff, to be sure. What the news director wanted to know, however, was what would happen if the team located a camera that Irvine was thought to be carrying? The film from the camera, if it could be developed, could show whether Mallory and Irvine reached the summit some thirty years before Sir Edmund Hillary and Tenzig Norgay. If the Sygma team could find and develop the film, Sygma would have some very valuable photos to license. Of course, they assumed I could easily determine who owned rights to the photos. I provided some initial hurried thoughts, but as the team was already on the mountain and had a limited window, I was only able to give the most cursory review. But the story and the issues stayed with me, long after the climb failed to locate Irvine’s body. After encouragement from friends, I started my research by reading articles describing the various search efforts. I came across a news article quoting climber Eric Simonson, who had led several search efforts that culminated in his team finding Mallory’s body in 1999. The find made headlines around the world. Simonson had said that a copyright lawyer would have a field day as he could bill for 20 years trying to conclude who might own the rights to the film. My draft article was finished in 2008, only (!) seven years later. I had done countless interviews with heirs of the climbers from the original 1924 Expedition, and climbers from the successful 1999 Expedition and subsequent attempts to find Sandy Irvine. When I had enough information to attempt a definitive answer, I completed a draft which lay dormant for nearly two years, until one morning when I arrived at my office to find a voice mail from noted Mallory and Irvine historian Tom Holzel. Holzel had sponsored and aided many attempts to locate Irvine, and his research helped locate Mallory. Holzel stated, rather matter-of-factly, that he knew where Irvine’s body was located, was in the process of working with a crew who was nearing the base camp of Mt. Everest, and could I kindly explain to him about the legal issues associated with the camera and its film. The ensuing conversation finally motivated me to tell my piece of the story. I hope you enjoy it as much as I enjoyed my research and investigation. The first chapter will be posted shortly, followed by successive chapters complete with links to the original documents, and historical photos.